In case you missed it, spirits are back. There was a dreary period, let’s call it the 80’s and 90’s when it seemed to be all about beer and wine. Who doesn’t love beer and wine, right? But sometimes you hanker for something more sophisticated, potent and exotic. Hell, beer and wine are doing just fine, so why not a resurgence of your bourbons, gins and scotches? A generous part of this hard-stuff renaissance stems from the growth of micro and local distilleries. Here in Boulder we have 303 Vodka, Roundhouse Gins, and others. In fact, Colorado is becoming a bit of a haven for craft inspired, artisanal types of booze. On top of that, they released a tiny (362 hand-numbered bottles) batch of Buena Vista Brandy. All of the grapes came from the Western Slope courtesy of Vino Salida Wine Cellars, spent time double-distilling in copper pots then finally aging in French oak and whiskey barrels. Sounds good, eh? But with so few bottles, you best unlock yourself from the couch and get on it. Stuff that stocking! I don’t imbibe much but I’m inspired by the innovative, artisanal ways in which limited batch and other spirits are made. I’m a sucker for a gorgeous label too. Thanks for the article (and great gift idea)! Allen – great article. We’re excited to announce that Wood’s High Mountain Distillery in Salida is just about to open and we’re preparing to release our Treeline Gin and Tenderfoot Whiskey. There are an amazing number of local options for spirits in Colorado right now and we’re champing at the bit to add our contribution to micro-distillery scene. Thanks and sounds great, Lee! The options are rich and rewarding. Happy holidays and all the best to ya! Great article! 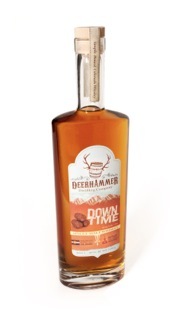 I don’t pay enough attention to local distilleries… I know my husband would go crazy for that Downtime whiskey! Thanks, Kristen. Maybe surprise him with a bottle under the tree!